Home / Blogs / BENNY B: HE’S BACK! As Pops Mensah-Bonsu signs with the New Orleans Hornets, sister Benny gives MVP the lowdown on his struggle to return to the NBA in the first of her occasional blogs. The walk to the top often seems easy to those not in the thick of it. But behind the scenes, it’s hard. Real hard. There are countless British players to whom you could ask ‘what happened? Why didn’t YOU make it?’. 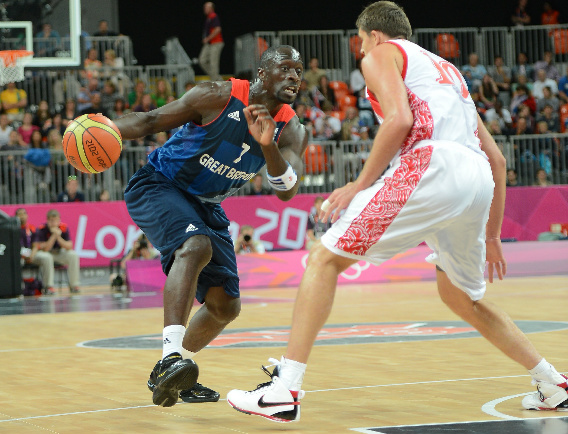 Pops Mensah-Bonsu – British-born Ghanaian and my brother – knows about the struggle. For the past couple of years he’s had his ups and downs with the NBA and the Euroleague. But he has handled each hurdle professionally and done what he has to do. Many things have been said about his abilities, his talent. But his determination cannot be questioned. This off-season’s plan was to work hard during the summer league in Washington DC, do great with Team GB and let God handle the rest. Spending all summer with my brother, it was obvious that his focus was unbreakable. He was hungrier than ever for what he felt belonged to him. But he still maintained his great sense of humour. 7am: Wake up call – and me making him 6 fried eggs and pancakes with lemon and sugar so he’d be set for his 2 – 3 hour morning workout. 1pm: Home for a quick nap and lunch with the whole family (Pops spending time with his beautiful daughter). Maybe a little Playstation 3 with the boys. 6pm: Summer league games with the family in tow. They’re held in the most ghetto area of DC, but everyone who’s anyone is there – Euroleague players, NBA guys. It’s the hangout, but also the best place to watch ball in the summer. 9pm: Home, then out to dinner with friends and fam – where the good old “north London is better than south at ball” argument always rages. Summer with Pops is all about two things – hard work and jokes. One minute we’re dancing or pratting around in Nando’s…the next, Pops in grinding – playing like tomorrow will never come. Today, it all paid off…he signed with the New Orleans Hornets. Stay locked to MVP247.com – where I’ll be bringing you monthly updates on his return to the League. Welcome back Papa. Let’s make it happen.